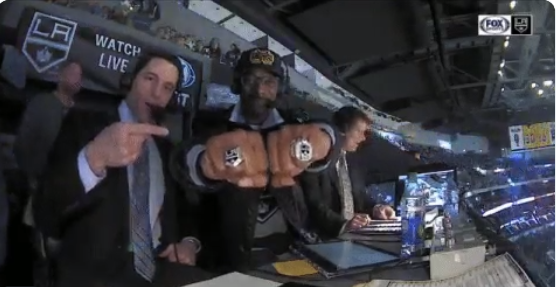 The marketing geniuses with the LA Kings decided to make Snoop Dogg the celebrity guest of honor for Hockey Night in LA during Saturday night’s game against the Pittsburgh Penguins. His responsibilities in this role included being the DJ during warm-ups, dropping the ceremonial puck at center ice, and doing play by play with the Fox Sports West announcing booth. This was obviously one of the greatest ideas ever concocted in sports media, and we’re chronicling it for you. Before starting his play by play duties, Snoop warmed up the crowd. I hope to god the LA traffic didn’t keep interested fans from missing this. Snoop apparently rolled into the game with a pair of women dressed as Princess Leia, because why not, right? Honestly, I could listen to this all day. Snoop gave himself high marks on the night and we did too. So while I’d like to say the MVP for tonight goes to Snoop, whoever’s brainchild this was deserves a goddamn raise. We live in incredible times.